After the Oscar wins for Best Picture, Best Adapted Screenplay and Best Supporting Actress for Lupita Nyong’o, it feels a bit redundant to now add to the buzz surrounding 12 Years A Slave but it is such a powerful story that it would be wrong not to review the memoir from which the film was adapted. I came to the book after seeing the film, intrigued by the story of Solomon Northup, a free black man living with his wife and children in New York until his kidnapping into slavery. The first thing that stood out for me in this novel, and indeed the film, is identity. Upon his kidnapping, Solomon repeatedly states his name and asserts his rights as a free man. But without ‘free papers’ to prove his identity and his free status, Solomon becomes who the slave masters say he is: a slave called Platt. In scenes reminiscent of that infamous scene in Roots, where Kunta Kente is mercilessly whipped until he submits to the name of Toby, Solomon too is beaten until he acknowledges his newly given identity. Despite this, Solomon never forgets who he is, never forgets his name, and ironically this is what rescues him in the end. Solomon’s determination to not forget his true identity is reflected in the way he deals with life on a plantation. He is hard-working, honest, and well-respected by the other slaves and to an extent his owners, though there are notable exceptions who would rather see him dead than acknowledge him as a fellow human being. In other slavery narratives, a man like Solomon could be written off as the ‘Uncle Tom’ character, most likely to betray the other slaves around him for his own gain. But not so with Solomon, while he identify himself as a slave’, having not been born in servitude, he recognises that by virtue of being a black man in a slave state, he is considered no different to his fellows. Solomon’s position as an outsider to the system of slavery also affords him the opportunity to comment upon it objectively. Like a journalist, he reports on all he observes from the painfully unfortunate experiences of Patsey the beautiful girl caught between her master’s lust and his wife’s jealous hatred for her, to life on the plantation, the systemic humiliations, the brutality, cruelty and psychological torture. Through this he makes it implicitly clear that slavery is a system that dehumanises both the slave and the master; the sadness being that even the most kind of slave owners such as Master Ford cannot see the inhuman nature of slavery because they have been raised within the system and cannot see a life without it. Though a bleak and dismal story, Solomon keeps alive his hope that he might escape or be rescued from slavery, that his real identity will be discovered. This lends a certain tension to the novel as you really hope this would be the case. But then the question is, how do you leave the others behind to continue suffering? The scene both in the book and the film when Solomon leaves the plantation was heartbreaking not only because his nightmare was coming to an end, but for others, like Patsey, theirs was to continue on. 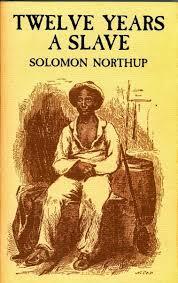 Not much is known about Solomon Northup after his emancipation. We know that he took his kidnappers to court but due to the laws of the time was unable to testify against them. They got off. He later became involved in the abolitionist movement, giving lectures about his experiences and publishing his memoir in 1853. Then, after a few years, knowledge of his whereabouts and his eventual death go unreported and undocumented. His memoir adapted as a made for TV film in 1984, after that knowledge of Solomon’s story was little known perhaps forgotten until the feature film was released last year and his memoir re-printed. Some people have said that there have been enough slavery narratives, we seen it all and we’ve heard it all and we know all there is to know. I personally think that’s a weak argument, considering there is something like 20 million people in slavery today, a figure that is likely growing. Memoirs, and films like 12 Years A Slave, are hugely important and should never be written off as ‘just another slave story’ because such stories remind us of our past, and give us an opportunity to change our present to better shape our future. Posted on 4 April 2014 5 March 2018 by queenpea77Posted in ReviewsTagged black history, books, film, identity, just-read, reviews, slavery. I didn’t know about the 1984 adaptation. Have you seen it? People who say there are too many slave narratives are (for the reason you mention and many others) just wrong. Ask them why there was such a response to this film. No I haven’t seen it. PBS first aired it, though I don’t know if they have, or plan to show it again in view of its recent popularity. There are clips available on YouTube. It’s called Solomon Northup’s Odyssey.